Most of the financial media covering CalPERS, save top reporters like Dan Primack, needs to wake up and start reporting on the giant pension fund’s gross misrepresentations about the private equity scheme it’s desperately trying to get its board to approve, despite staff’s failure to offer coherent reasons. The fact that CalPERS plans to have the board agree today to change its policy so as to end direct investments, as well as limit other types of private equity investing, might get asleep-at-the-wheel members of the press to recognize that they’ve been snookered. As we, private equity expert Ashby Monk of Stanford, and some reporters like Primack have pointed out, what CalPERS is planning to do has nothing to do with direct investing. Perhaps CalPERS formal renunciation of direct investing will get them to sit up and take notice. On top of that, senior figures in the limited partner community have taken it upon themselves to contact the board to try to tell them that the CalPERS plan is the nuttiest thing they’ve ever heard of. For those new to private equity, “direct investing” is when an investor uses its own employees to make and oversee investments in companies, rather than rely on the costly middlemen. Most reporters have been so lazy that they’ve merely looked at the name CalPERS has applied to its gimmick, “CalPERS Direct,” and failed to examine its substance. The reason that direct investing is being more widely adopted among major private equity investors like sovereign wealth funds, and now public pension funds, is to cut out costly private equity fund managers. CalPERS confirmed in a 2015 workshop that private equity fees and expenses are roughly 7% a year. When private equity was generating eye-popping results, no one cared much about costs. But returns to private equity investments have fallen over the last decade, to the degree that a recent analysis by Oxford professor Ludovic Phalippou, using the most rigorous method and is also suited for comparing private equity performance to that of other investment strategies, found that over the last decade, private equity has not outperformed the S&P 500. CalPERS own metrics have shown that private equity has generally failed to meet its benchmarks over the past decade. And CalPERS’ consultants forecast that private equity would not meet its benchmarks over the next decade. But rather than start moving more private equity management in house to cut these ginormous costs and improve net returns, as more and more major investors are doing, CalPERS is instead plans to go pedal to the metal in the opposite direction. CalPERS intends to create two entirely new companies which will effectively be dedicated general partners.1 CalPERS won’t even choose any board members. The new entities will choose them…. which mean CalPERS will have even less influence and insight over what the vehicles are doing that it does in traditional private equity funds, since CalPERS is often a member of their advisory committees. CalPERS may also give up other limited-partner protections, such as key man provisions and language that describes the scope of investments. It is highly unlikely that there will be savings because skilled professionals will insist on having compensation potential similar to what they get now, particularly since CalPERS has maintained it could unwind the deal at any time.2 Accordingly, when asked specifically by a Bloomberg reporter if CalPERS expected to lower cost, Ted Eliopoulos effectively said no. The rationale that Eliopoulos has harped on makes no sense, namely, that CalPERS needs its own pet vehicles because it is having trouble investing “at scale”. That assertion needs to be laughed out of the room. For starters, even bigger investors in private equity have said nothing of the kind. At best, it is proof that Eliopoulos wasn’t the man for the Chief Investment Officer job. Accordingly should have nothing to do with formulating an untested strategy that is going in the opposite direction of what CalPERS ought to be doing. First, as private equity professionals point out, anyone can deploy money rapidly. As the founder of a major private firm said, “I could close a fund at 9 AM and be fully invested by noon if I wanted to be.” The hard part is not buying companies, it’s buying good companies at attractive prices. And the reason that is tough now is that so many fund managers have record levels of “dry powder,” as in committed capital waiting to be deployed. Setting up new vehicles out of CalPERS’ control is not going to do anything to solve the overall problem of way too much money chasing too few deals. In its review, however, Meketa, which succeeded Pension Consulting Alliance as private equity consultant effective March 31, says the program may not realize optimal returns and may not be able to maintain the 8% target to the asset class. The review says by relying on 30 managers who are concentrated primarily in mega- and large buyout strategies, CalPERS may miss out on better returns from other managers. “Other strategies such as mid and small buyouts, and growth could provide stronger returns as well as strategy and manager diversification,” the review said. The review also said CalPERS has not received meaningful fee reductions that were not available to other limited partners, and the program has shown an inability to deploy the larger commitment amounts it desires to obtain. Help me. Why is simplicity a plus? It was at best a means to achieve other ends, and per Meketa, the approach hasn’t worked. That means CalPERS is stubbornly doubling down on failure. Bear in mind that the proposed policy will restrict co-investments further than now (for those of you still getting your arms around private equity jargon, a “co-investment” is when a general partner allows an investor to take a minority stake in a portfolio company, typically at lower fees than for any ownership position through the private equity fund). CalPERS plans to restrict these investments to managers that CalPERS already has a relationship with. This limitation is bizarre given that CalPERS’ own experts, such as panelists at an offsite in July 2017, recommended co-investments as a way for CalPERS to improve performance and build skills. This change looks even more dodgy give that staff, starting with Chief Investment Officer Ted Eliopoulos, has repeatedly claimed that the main problem facing CalPERS private equity program is the supposed inability to put out the money. Would CalPERS really say no to a co-investment opportunity with Bain Capital just because CalPERS does not have a relationship with Bain? In addition, as you can see in 4 above, the proposed policy says that the CalPERS commitment to any one fund cannot exceed more than 25% of total committed capital. However, in any “separately managed account” private equity relationship, CalPERS will constitute by definition 100% of the capital in the fund that constitutes the vehicle for the separately managed account. Now it is possible that CalPERS intended that the 25% limit to apply to the entire “fund complex,” but if so, that should be clearly stated. Otherwise it is just sloppy. And that’s before you get to the fact that this document is silent on many policy parameters governing private equity investments, such as guidelines for minimum general partner commitment, acceptability of the general partner meeting its commitment via management fee waiver, fund leverage, permissible jurisdictions (e.g., Cayman Islands, Jersey Islands) for funds to be organized in, and many others. In fact, this snippet serves as as reminder as to how confused this process is. Any specific programs, including the CalPERS supposedly gee-whiz-newfanged private equity gimmickry, should be consistent with and implement policy. Launching initiatives and then making the policy conform to them makes clear that the policy-making is a joke. Nor does this “we’ll tidy things up later” language allow loyalists to claim that CalPERS new scheme will be direct investing. Per the chart below, you can see that we are not exaggerating when we call Eliopoulos’ sales patter a Big Lie. Repeating the word “direct” does not make it so. any more than when Trump doubles down on things that are obviously false, like his inauguration getting record turnout. In other words, what CalPERS is doing is awfully reminiscent of the old joke someone shooting their parents and then asking for sympathy for being an orphan. But CalPERS has managed to be even more brazen. The CalPERS version of this saw would be that someone shot one parent and sought special treatment for being an orphan, and then shot the second one since one dead parent clearly wasn’t good enough. CalPERS first shot its ability to deploy its private equity dollars as broadly as it could by greatly restricting the number of managers it will use, and is now taking its second shot by eliminating direct investing and separately managed accounts and restricting co-investments. But this isn’t a joke as far as CalPERS beneficiaries and California taxpayers are concerned. They have to live with the consequences of CalPERS’ self-serving management. Update 2:30 PM. We had another example of CalPERS’ culture of casual lying at the Investment Committee meeting today. Although we did not address it in the post, the new policy specified that CalPERS could invest in second quartile funds. We didn’t consider this to be worth discussing because the current policy didn’t limit staff regarding which quartile it invested in (separately, this change is pointless for other reasons, such as academic studies have ascertained that 77% of finds can cut the data so as to claim they are top quartile). Staff yer again lied and said the policy change was necessary to allow them to invest in second quartile funds. Board members Robert Costigan and Theresa Taylor backed staff in this misrepresentation. 1 If you think these new private equity vehicles will remain dedicated to CalPERS, I have a bridge I’d like to sell you. The professionals manning this venture will recognize that CalPERS’ continuing support is an existential risk. They will make persuading CalPERS to allow other investors to join a top priority. 2 Some CalPERS board members actually seem to believe that statement. First, if the private equity vehicles have bought any companies, it will take time to exit unless CalPERS is so eager to escape that it is willing to take fire-sale prices. Second, you can be sure that the professionals running these businesses will get terms included in their agreements that will make it costly to CalPERS to shut down these ventures. 3 CalPERS may claim that separately managed accounts are called “custom accounts” in CalPERS-(and-even-industry)-speak and therefore the section we highlighted does not apply to them. 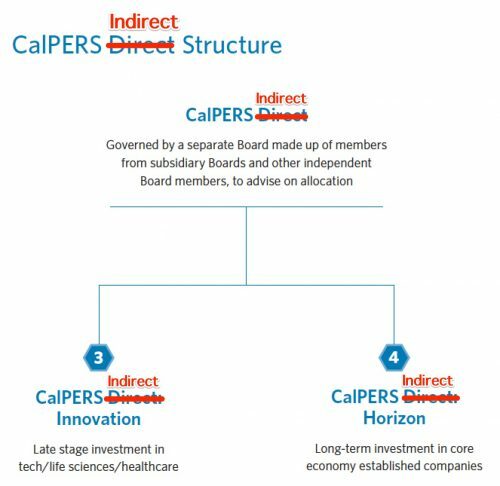 At best, as we pointed out, it is incompetent for CalPERS to be at the “second reading” stage of presentation to the board and for no one to have caught that different provisions of CalPERS policies contradict each other. At worse, it gives the impression that CalPERS board members, and potentially staff members, don’t even comprehend that the legal structure of a seperately managed account is that CalPERS is a sole limited partner and thus inherently providing 100% of the limited partner monies to that fund. 4 The fund managers have worked around the “most favored nation” restrictions to a degree by allowing for tiered pricing, with, say, investors who commit up to $100 million getting one set of fees, investors who commit $100 to $250 million getting better fees, and investors who pony up $250 million or more getting the best deal. In addition, these restrictions aren’t as absolute as they might sound. Fund managers do give concessions to specific limited partners via so-called “side letters,” but those carveouts are generally to accommodate jurisdiction-specific legal or regulatory requirements. This entry was posted in CalPERS, Investment management, Private equity on August 13, 2018 by Yves Smith. Hard to understand why CalPERS is doing the opposite of what a pragmatic approach should be doing. It is certainly not ideological as I have never seen a whiff of this after so many stories on this mob. And why would CalPERS seek to create two new companies without having a say-so on who will be on their boards? The only reason that comes to mind is that a bunch of their buddies is in need of good paying jobs and this is one way to create them without board oversight on who gets those seats. Maybe management will seek to get board approval for these two companies by saying that they will be in competition with each other for investments from CalPERS. You know – competition being the lifeblood of capitalism, blah, blah, blah. I am still uncertain of the setup but maybe down the track when things blow up, they may come in use. All the bad investments could be transferred to the “bad” company while all the still healthy investments could go to the “good” company. Then the former can be let go down in flames. Just a thought. The question is cui bono? Obviously, PE benefits, but equally obvious is that a person or people who WORKS AT CALPERS PERCEIVES A SPECIFIC AND PERSONAL BENEFIT FROM THIS. This is the part of the equation I have yet do divine? My assumption is that some sort of revolving door stuff is going on, but I’ve yet to see any coverage of this. The other possibility is that something blew up with direct investments, and the institution is still traumatized by this. I saw this with the US Army, where they had developed an official policy of not discussing what they wanted with a weapons system, only what they didn’t want, as a result of the implosion of the DIVAD program. Does anyone have any context here? That this should still be an issue for CalPERS is astonishing. In the pensions and insurance industry, it has been a topic not only amongst investors, but of fund managers too for getting on for five years. Low interest rates mean low real returns. This is both nominal and also on a risk-adjusted basis. This is not going away (see recent pronouncements by the Bank of England). And I cannot remember for my entire adult live (so we’re talking nigh on 30 years) when interest rates in, say, Japan have been anything other than bumping along the bottom. In this environment, managing your cost of funds under management is absolutely essential. If unadjusted low risk returns are, say 5 to 10% per annum, then a fee of 2 or 3% is acceptable. If you’re getting into higher risk asset classes or investment strategies which might yield 10 to 15%, you might — and only “might” tolerate fees of up to 5%. But if you’re getting at best 5% returns then your fees should never rise above 1-2% absolute maximum. Here in the UK, 0.5% is considered the top end of what a pension fund should charge, on average, across all investment approaches (when you net out the high risk / high fee vehicles against the low risk / low fee ones). There’s even been talk https://www.bbc.co.uk/news/business-26086488 of legislation to cap this in statute. What on earth, then is CalPERS doing tolerating 7% fees for private equity investment? To bring their overall fund costs for management down to 0.5% they would most likely have to have negative costs of fund administration for low-risk assets (like investment grade corporate bonds or maybe muni’s) — this is clearly impossible as every asset class has some trading costs, somewhere. CalPERS blathers on ad nauseum about how its strategy emphasises “clearly articulated performance, risk, and cost metrics” — but then doesn’t articulate these metrics anywhere as performance targets with any teeth (as in, consequences for staff for underperformance). And this very blog has been banging on for two years at least about how CalPERS fiddles its published performance stats for private equity. Sitting here and watching the beneficiaries, their state employers and the state itself getting royally turned over by CalPERS with nary so much as a polite cough in CalPERS’ direction that they might like to be slightly less opaque in the data they give has me scratching my head perplexing. I know you guys and gals in CA are laid back types, as a rule, but boy, you must exceed even my notions about how unfussed you are about things. Or maybe it’s the old story of how the voters are hopping mad, but it falls on the deaf ears of a one-party-state taking its right to govern for granted? Reader’s enlightenment welcome on this one, I genuinely am stumped as to how this happens. Your last para is the bit I’m still missing after all the good work that Yves did here. Ok, I take it a lot of voters aren’t CalPERS beneficiaries, but surely, the former and, especially, the future ones should have more clout than your average Joe voter has? I just don’t get it. At the best, the CalPERS management is mismanaging their (beneficiaries, not managements!) assets, at the worst they are party to looting by the PE companies and consultants.. How come this is of little to no interest even to them (which is what it looks like from outside)???? They can’t get this much this wrong this often without a plan. The “plan” might be working perfectly. Thanks again to NC for your continued reporting on CalPERS, PE, and pensions. And I cannot remember for my entire adult live (so we’re talking nigh on 30 years) when interest rates in, say, Japan have been anything other than bumping along the bottom. Well Tokyo kind did feel like stepping into the future when I visited a decade or so ago. Their lost decade is up to 27 years and counting. When did running a pension fund shift from being the domain of the boring cardy-wearing actuaries anyhow? The madcap chase for returns really is ridiculous. The Califionian Private Equity Retiremet Scheme. Finally, a scheme a private equity partner can retire on! Are you a large Private Equity General Partner? Our scheme is just for you! Money made, no questions asked! We guarantee you’ll retire even richer than you are now! Eliopoulos has a pattern of handing investments over to outside managers who then saddle CalPERS with “market losses” before handing the assets over to industry insiders at fire sale prices. How people can’t see this is beyond me. He sits there all doe-eyed and everyone tut-tuts about how dumb he is. I think that he has to be a crook. Last week’s post (thank-you, Yves) about timber investments scooped-up by “CatchMark” after CalPERS took a 20 percent, half-billion dollar loss — while paying $52M in outside management fees — reeks of a set-up. Allowing Eliopoulos to institute such a comprehensive attack on transparency without making him own the results is an abandonment of fiduciary responsibility on such a grand scale that it will subject the board members to personal liability at a level of pain that they clearly can’t even imagine when beneficiaries file suit against them. Not everything bad that happens in investment-land at CalPERS is Ted Eliopoulos’ fault. The timber investment was made before he became CIO, so it can’t be blamed on him. However, his predecessor Joe Dear was a similar type: no real investment expertise, made a nice appearance at board meetings, prioritized smooth interpersonal relationships over performance. Fire-sale to insiders was on Ted’s watch. He also ran real estate and real assets when this investment was entered.